Clause 3.2.2.1 Methods for evaluating earthquake input for different hazard levels include zonation map-based procedures and site-specific studies. The latter are primarily employed for large projects, such as long bridges, nuclear power plants and/or when site amplification effects, e.g. on soft soil sites, are expected. It is also the only approach feasible in the assessment of geographically distributed systems subjected to spatially varying ground motion. Soft soil sites filter out short periods and amplify longer periods, and may cause large amplification of response quantities. Map-based procedures, such as those normally provided by national authorities in Europe, use maps of the PGA to define the seismic input at one or more different hazard levels and under different site conditions. Consequently, the earthquake ground motion at a given site is described by the response spectrum, which may be elastic (theoretical response of a single degree of freedom (SDOF) system in the elastic range), inelastic (theoretical response of an SDOF system with inelastic load- deformation characteristics), or design (smoothed and adjusted spectrum taking into account non-theoretical features and requirements for safe design, e.g. providing a minimum base shear for long-period structures). A response spectrum is a plot of the maxima of the acceleration (a), velocity (v) or displacement (d) response for an SDOF system with various natural periods when subjected to an earthquake ground motion. A family of curves is usually calculated for any given excitation, showing the effect of variation of the structural damping. The latter is expressed in terms of the equivalent linear viscous damping ratio (£). For many practical structural applications it can be time saving to employ the maxima of the above response parameters (a, v and/or d) rather than their values at each instant during the response; these maxima are 'spectral values'. Response spectra can be computed from earthquake accelerograms, either natural or artificial, by means of several computer programs. Freeware versions of software such as SEISMOSIGNAL and USEE are available on the Internet at http://www.seismolinks.com and http://mae.ce.uiuc.edu/usee, respectively. These programs implement numerical algorithms to integrate the equation of motion for an SDOF system for given constitutive action-deformation relationships and damping ratios Time steps and parameters of the integration schemes, for example the Newmark and/or Wilson method, can be specified for the earthquake record being considered. The elastic response spectra can be derived analytically by means of Duhamel's integral, which provides the total displacement response of an SDOF system subjected to earthquake loading. The maximum value of the displacement Sd (spectral displacement), can be derived by using principles of structural dynamics. Displacement response spectra are essential for modern seismic design approaches, such as displacement-based design.16 Considerable analytical efforts have been undertaken (e.g. see Bommer and Elnashai17, Tolis and Faccioli18 and Borzi et al.19). Such spectra are discussed in informative Annex A of EN 1998-1. Acceleration response spectra are related directly to the base shear used in the seismic design, and hence they are implemented in force-based codes, such as Eurocode 8. Response acceleration spectra can be computed for the three translational components of earthquake ground motions, e.g. horizontal (longitudinal and transversal) and vertical. Horizontal and vertical spectra are influenced by different frequency contents and ground accelerations. Their shapes and values are discussed in clauses 3.2.2.2 and 3.2.2.3, respectively. For a given component of ground motion, the response spectra depend significantly on the relative distance between the seismic source and the observation site. For example, Fig. 3.4 shows the response spectra for the 1940 El Centro and the 1994 Northridge earthquakes, which are representative of strong motions registered close to and far from the seismic source, respectively. Differences in shape between far- and near-source response spectra are due to the frequency content of the input motion. The former are generally broad-band signals, while the latter are narrow-band, pulse-like records. For distant earthquakes, the rupture can be assumed to be uniform and instantaneous; the ground motion at the site is influenced to a lesser extend by the source seismological characteristics. This assumption cannot be safely made for near-source earthquake ground motion; site-specific studies are warranted. Vertical components of ground motion show typical features of near-fault records, as discussed further in clause 3.2.2.3. Elastic spectra are useful tools for structural design and assessment. They do not, however, account for the inelasticity and stiffness and strength degradation experienced during severe earthquakes. Structural systems are not designed to resist earthquake forces in their elastic range, excepting a very few cases of safety-critical installations (e.g. nuclear power plants, which are not covered in Eurocode 8). Concepts of energy absorption and plastic redistribution are used to reduce the elastic seismic forces by as much as 80%. As already described in Section 2.2.2.1, the inelastic behaviour of structures is quantified through the behaviour factor (q), provided in the relevant parts of Eurocode 8. 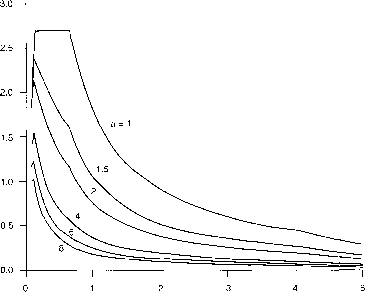 High q values correspond to large inelastic deformations; for linearly elastic systems, the behaviour factor is unity. Thus, inelastic spectra for a target level of inelasticity were estimated by dividing the ordinates of the elastic spectra by the q factors (e.g. see Newmark and Hall,21 Borzi and Elnashai,22 and many others), as discussed in clause 3.2.2.5. Generally, elastic spectra are derived from a specific ground motion, and hence they have the physical meaning of the maximum response of the SDOF system under earthquake ground motion. 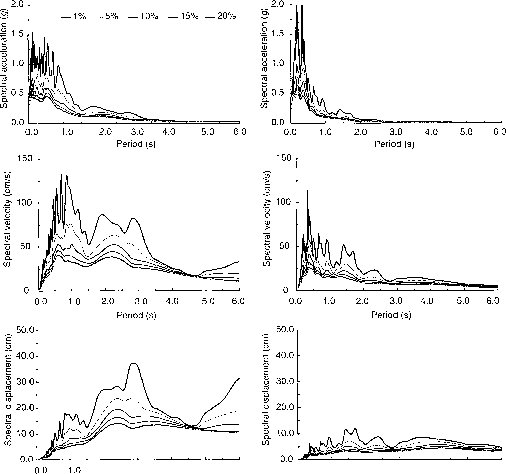 They possess irregular shapes due to peaks and valleys, and are not suitable for design because of the difficulties encountered in determining the exact frequencies and modal shapes during severe earthquakes when the dynamic response is likely to be highly non-linear.25 Conversely, design spectra are more appropriate for design purposes. They are derived from statistical analyses using either the mean, median (50th percentile probability level), or the median plus one standard deviation (84th percentile probability level) of the ground motion parameters for the records chosen. Such spectra are often modified by engineering judgement. Their ordinates may, however, not have any physical meaning. Design response spectra can be defined for each component of the earthquake motion: longitudinal, transverse and vertical. 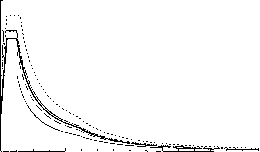 In EN 1998-1, elastic response spectra are presented as smooth curves and/or straight lines; therefore, they correspond to elastic design spectra. to-intense earthquakes possess the same frequency content. Note that clause 3.2.2.1(4) specifies that for the three components of the seismic action, one or more alternative shapes of response spectra can be adopted, depending on the seismic source and the earthquake magnitude. Horizontal components of the seismic action are defined in Eurocode 8 through the horizontal elastic response spectrum given by equations (3.2)-(3.5) in EN 1998-1, where Se(T) is the value of the elastic response spectrum for the vibration period T of a linear SDOF system. The design acceleration (a„) in the above equations is that corresponding to ground type A according to equation (D3.7) above. The soil effects are, in fact, accounted for through the soil factor S. The latter is by definition equal to 1.0 for ground type A. Recommended values of S for the other standard ground types are provided in Table 3.2 of EN 1998-1, along with the corner periods (TB, Tc and TD). The period TD defines the beginning of the constant displacement response range of the spectrum; this period does not change significantly with the ground type. To avoid overestimation of spectral ordinates in those areas of Europe affected only by moderate-magnitude earthquakes whilst still only mapping a single ground-motion parameter, e.g. PGA, two types of spectra are recommended in Eurocode 8 for the horizontal elastic response spectrum: type 1 and type 2 (see Figs 3.6, 9.3, 9.5 and 9.6 of this guide). These spectra are classified as a function of the magnitude of the earthquakes that contribute most to the seismicity at the given site, for the purpose of the probabilistic seismic hazard. If the earthquake that contributes most possesses a surface wave magnitude (Ms) not greater than 5.5, the type 2 spectrum may be adopted (moderate-seismicity context). Alternatively, the type 1 spectrum should be used (high-seismicity context). It is instructive to note that for earthquakes characterized by Ms > 5.5 (type 1) the maximum spectral amplifications occur at frequencies lower than the corresponding of the spectra of type 2.
minimum threshold value of the damping correction factor is also provided (// = 0.55). Such a value corresponds to a maximum equivalent viscous damping of about 30% (£ = 28%). Note that for £ = 5% the factor rj = 1.0. 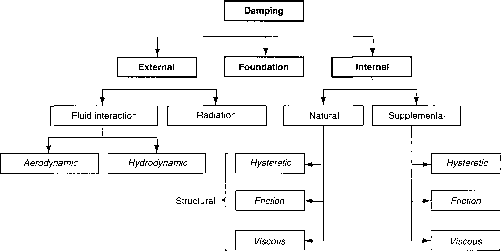 Generally, it is not straightforward to quantify the total damping associated with the different mechanisms in structural systems, as shown in Fig. 3.5. Therefore, an equivalent viscous damping ratio £ is employed. Indicative values of £ from the literature are provided in Table 3.1, as a function of the material of construction and of the limit state to be assessed. The spectra provided in Fig. 3.6 are for 5% damping and normalized by a . If values of viscous damping different from 5% are deemed necessary, these values are then specified in the relevant parts of Eurocode 8.
normally holds for periods of vibration (7) not greater than 4.0 s. For very flexible structures, i.e. structures with T > 4.0 s, a more refined definition of elastic displacement response spectrum should be sought. For the type 1 spectrum, Eurocode 8 provides such a definition in informative Annex A of EN 1998-1. For periods T > 4.0 s, the elastic acceleration spectrum can thus be derived from the elastic displacement spectrum by inverting equation (3.7). whilst secondary shear S waves are the main cause of horizontal components. The wavelength of P waves is shorter than that of S waves, which means that the former are associated with higher frequencies. The vertical component of the seismic action can be defined through the vertical elastic response spectrum. The commonly used approach of taking the vertical spectrum as two-thirds of the horizontal, without a change in frequency content, has been superseded.28 The vertical elastic spectrum is provided in equations (3.8)-(3.11) of EN 1998-1. Three corner periods, i.e. TB, Tc and TD, as well as the vertical component of ground acceleration avg should be provided by national authorities. Nevertheless, as for the horizontal elastic response spectrum (see Section 3.2.2.2), two types of vertical spectral shapes are recommended: type 1 and type 2. The latter should be employed when the earthquake that contributes most to the seismic hazard for the site has magnitude Ms < 5.5. The values of TB, Tc and TD recommended by Eurocode 8 are provided in Table 3.4 of EN 1998-1, and are the same for type 1 and type 2 spectra. The values of the control periods for vertical spectra are smaller than those for horizontal spectra; the former are, in fact, characterized by a higher frequency content than that of horizontal components. 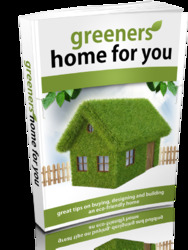 In addition, for intense earthquakes, e.g. those with Ms > 5.5, the vertical component of the peak ground acceleration (a ) can be as high as the horizontal counterpart (ag): avg = 0.9a . In turn, for earthquakes with Ms < 5.5, the recommended value of the ratio aKJa& is equal to 0.45. Ground displacements are generally difficult to estimate accurately because of errors in Clause 3.2.2.4(I) signal processing in the filtering and integration of analogue records.11 Special studies may be performed to evaluate the design ground displacement (dg) for a given construction site. Attenuation relationships for ground displacements and design spectra for European regions were derived by Bommer and Elnashai17 and Tolis and Faccioli.18 Alternatively, a simplified relationship to compute dg is provided in equation (3.12) in EN 1998-1, in terms of the design ground acceleration, a , the soil factor, S, and the corner periods of the response spectrum, Tc and TD, as defined in clause 3.2.2.2. Response spectra scaled down by behaviour factors (q) are provided in equations (3.13)-(3.16) in EN 1998-1, for both horizontal and vertical components of the ground motion. By calculating actions from the scaled spectra, inelastic analyses are avoided and the energy dissipation capacity of structural systems is accounted for in a simple manner, by performing an elastic analysis based on design spectrum. Design spectra reduced by q > 1 can be utilized to evaluate design forces for structural systems responding inelastically under earthquake loading. In the relationships of clause 3.2.2.5, Sd(T) is the design spectrum, q is the behaviour factor and ¡3 is the lower bound factor for the horizontal design spectrum. The last is provided by national authorities; the recommended value proposed in EN 1998-1 is 0.2. The value of the accelerations ag and avg of the soil factor S and of the corner periods Tc and TD are those specified in clauses 3.2.2.2 and 3.2.2.3 for the horizontal and vertical components of ground motions, respectively. 3.2.2.5(8) structures with base isolation and/or energy dissipation devices. In these cases, special studies are required to derive the spectra to employ in the structural analysis and design. What is pseudo acceleration response spectrum?